This record, a collection of jazz standards made partly at the request of her mother, was planned by Barber for over ten years but held. "It was important to me that I try and establish my own sound, my own music, before I did a record of standards. With 'modern cool' I felt I had done that," says Barber. Nightclub benefits from the long incubation period. 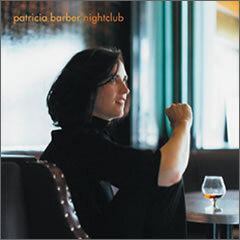 Barber is a seasoned performer of classic jazz material. Highlights include her stunning version of "Yesterdays," the rarely recorded vocal version of "Invitation" and her version of Alfie, which features guitarist Charlie Hunter. Musicians: Patricia Barber, piano, vocal; Michael Arnopol, bass (5, 9, 10); Adam Cruz, drums (4, 5, 6, 8, 9); Charlie Hunter, 8-string guitar (4, 6, 11); Marc Johnson, bass (1, 2, 3, 7, 8); and Adam Nussbaum, drums (1, 2, 3, 7, 8).